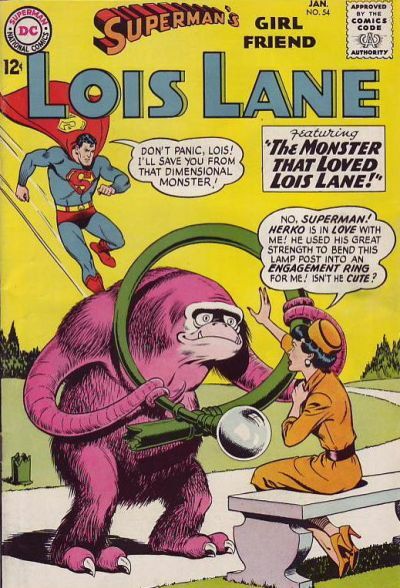 Episode #378 Part II: Superman Family Comic Book Cover Dated January 1965: Superman's Girl Friend Lois Lane #54! Superman's Girl Friend Lois Lane 54, January 1965! Download Episode 378 Part II! NOTE: On the last episode, listener Halk-Kar wrote a comment about a real building in New York City that resembles the one shown on the cover of SUPERMAN 174, which had traffic flowing through it in both directions. He shared this link where you can read more about it. SUPERMAN'S GIRL FRIEND LOIS LANE 54, January 1965, was published on November 12, 1964. It contained 32 pages for the cover price of 12¢. The editor was Mort Weisinger, and the cover was drawn by Kurt Schaffenberger and lettered by Ira Schnapp. The cover featured the issue's third and final eight page story. - (6:23) LOIS LANE, CUPID, writer unknown, drawn by Kurt Schaffenberger. - (26:36) LETTERS TO LOIS column. - (32:41) LOIS LANE, DAILY PLANET EDITOR, written by Leo Dorfman, penciled by Curt Swan, inked by George Klein and lettered by Milt Snappin. This story was reprinted in SUPERMAN: DAILY PLANET. - (51:59) THE MONSTER WHO LOVED LOIS LANE, written by Edmond Hamilton, drawn by Kurt Schaffenberger and lettered by Vivian Berg. This story was also reprinted in SUPERMAN'S GIRL FRIEND LOIS LANE 113, September/October 1971, published on July 6, 1971. It contained 32 pages for the cover price of 35¢. Next Episodes: SUPERMAN COMIC BOOKS COVER DATED JANUARY 1965: PART II: 80-PAGE GIANT 6 (featuring Superman), PART IV: ACTION COMICS 320 & PART V: SUPERMAN'S PAL JIMMY OLSEN 82! Then we will feature: SUPERMAN FAMILY COMIC BOOKS COVER DATED FEBRUARY 1965: WORLD'S FINEST COMICS 147, PART II: SUPERMAN 175, PART III: SUPERMAN'S GIRL FRIEND LOIS LANE 55 & PART IV: ACTION COMICS 321! Episode #378 Part I: Superman Comic Book Cover Dated January 1965: Superman #174! Download Episode 378 Part I! SUPERMAN 174, January 1965, was published on November 4, 1964. It contained 32 pages for the cover price of 12¢. Mort Weisinger was the editor, and the cover was pencilled by Curt Swan, inked by George Klein and lettered by Ira Schnapp. It featured the issue's first story. - (1:02) Comment left at the bottom of last week's episode. - (4:38) A special installment of the MY PULL LIST segment, where I review ACTION COMICS 1,000. - (18:24) CLARK KENT'S INCREDIBLE DELUSION (16 pages divided into two 8 page parts), written by Edmond Hamilton and drawn by Al Plastino, according to Mike's Amazing World Of DC Comics and the Comic Book Database. 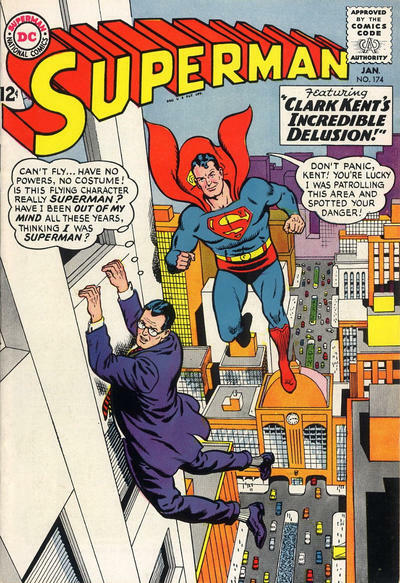 The Grand Comic Book Database credits Curt Swan as pencilling the title splash page, which was inked by George Klein, and Al Plastino as the artist for the rest of the story. - (36:03) THE END OF A HERO, part II of CLARK KENT'S INCREDIBLE DELUSION. - (55:29) SUPER-MXYZPTLK ... HERO (8 pgs. ), written by Jerry Siegel and drawn by Al Plastino. This was Siegel's 52nd silver age Superman story which we've covered on this podcast, and his 134th overall for the era. Next Episode: SUPERMAN FAMILY COMIC BOOKS COVER DATED JANUARY 1965: PART II: SUPERMAN'S GIRL FRIEND LOIS LANE 54, PART III: 80-PAGE GIANT 6 starring Superman, PART IV: ACTION COMICS 320 & PART V: SUPERMAN'S PAL JIMMY OLSEN 82! Group or Page on facebook, and follow the podcast on twitter @supermanpodcast. You can also keep track of the podcast on Tumblr, Medium, Flipboard, the Internet Archive and Stitcher.